I’m always looking for short cuts in my kitchen that don’t sacrifice taste. 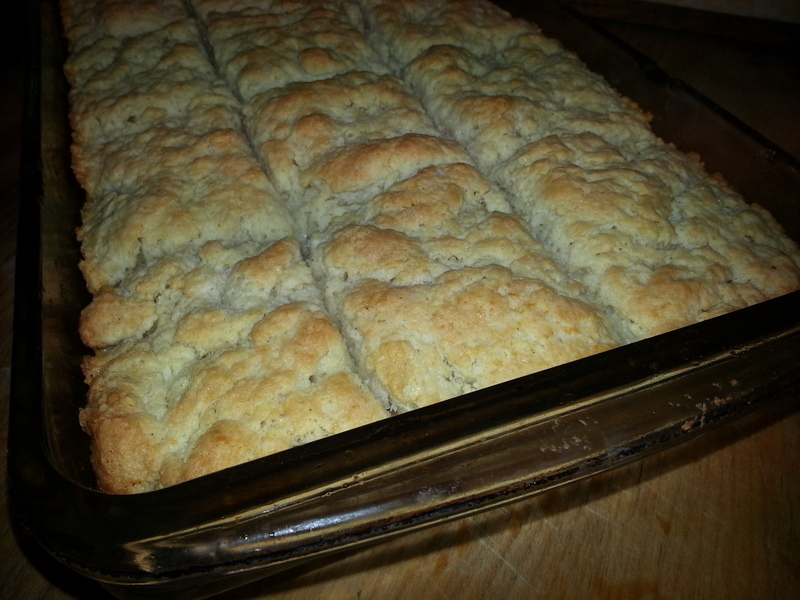 This recipe is adapted from a recipe that I found over at CountryCook.net, and it definitely fits the bill. Brandie, the recipe author, is a genius. Making biscuits in the morning can be time consuming and labor intensive, but this recipe goes together quickly, and you can finish getting dressed and round up the kids for breakfast while it bakes. 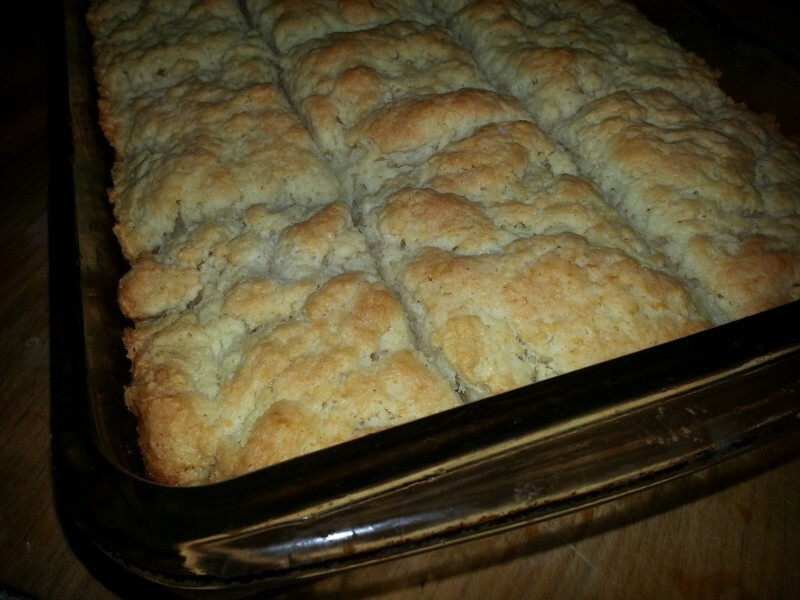 Of course, biscuits aren’t just for breakfast. This would also go well as a side for a hearty stew, or as an accompaniment to any of Brandie’s delicious slow cooker recipes like this recipe for creamy chicken and potatoes. The secret that makes these biscuits so simple is that there is no cutting or dropping the biscuits onto a baking sheet or into a pan. Instead, the dough is pressed into a prepared pan that contains a stick of melted butter. Once the dough is spread out to all of the edges, a knife is used to cut it into individual biscuits. My recipe recommends that you use and 8X8 inch pan. In my photos, I used an 8X12 inch pan. This made my biscuits slightly smaller, but I ended up with 12 of them instead of only 9. 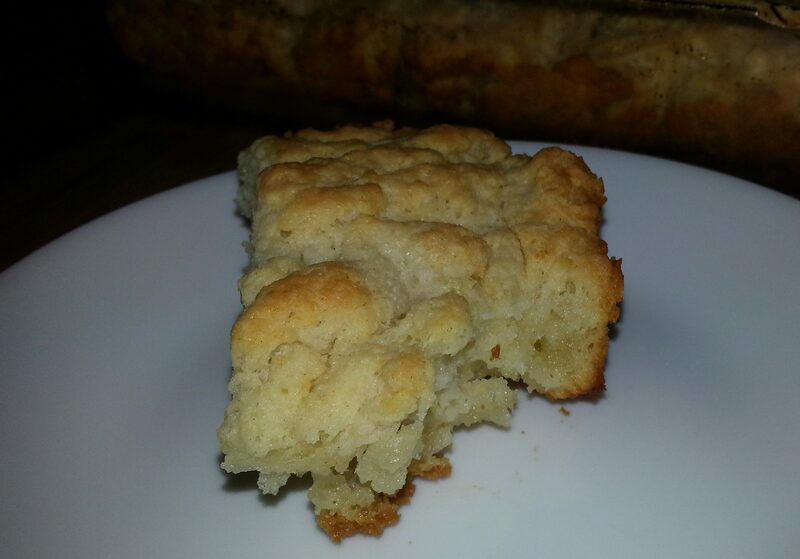 On the morning that I made these, I needed to have more than 9 biscuits, and didn’t want to double the recipe. No one noticed that their biscuits weren’t as large. They were too busy eating them. Keep that in mind as a budget stretching tip–33% more biscuits from the same recipe. Just don’t try to make them too small or spread them into a pan bigger than 8 X 11. Here’s your recipe. Give our 4 ingredient butter biscuits a try and let us know what you think. Biscuits are a great accompaniment to many breakfast dishes as well as saucy dinner dishes and stews. This recipe is very simple and the biscuits are in the oven in no time leaving you free to get ready while they bake. Melt butter in the bottom of a 8X8 or 9X9 inch baking pan. You can do this by sticking it into the oven for a couple of minutes while you mix up the batter. Mix together the flour, sugar, and buttermilk, stirring until it forms a sticky batter or wet dough..
Pour the batter into the baking dish containing the melted butter. Using a spatula or your fingers, spread the dough evenly to the edges of the pan. It will stick to your fingers or the spatula. This can be resolved by dipping the spatula into some of the melted butter and putting it on top of the dough or by lightly oiling your fingers. DO NOT STICK YOUR FINGERS IN THE HOT MELTED BUTTER! YOU WILL BE BURNED. Once the dough has been spread out, using a knife, carefully cut the dough into nine pieces. Think of drawing a tic tac toe board through the dough. The butter will run up through these cuts. Place pan full of biscuits into the 425 degree oven. Bake for 20 - 25 minutes or until they are light golden brown. Easy and Simple recipe. Looks yummy. I saw a celebrity making biscuits, or was it bread, on Rachel Ray a few years ago with the joy of crumbling the flour and enjoying the handmade process. That’s alright, but i like the ease of this receipe. I’ll let you know when i try it. Right now I’m having a hard time keeping my home cool in this heat. I know what you mean. I get up very early and make sure I am finished with any baking before 9:00am. That way, I can turn off the oven before the house begins to warm up. I don’t like to even turn on my stove in the evenings.